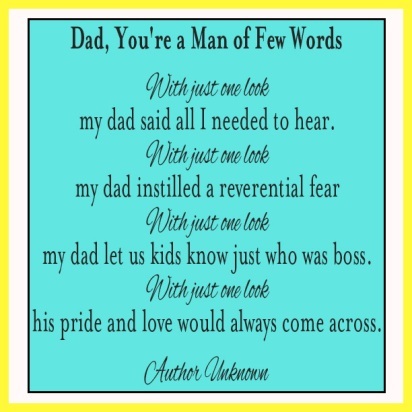 If you’re looking for Father’s Day poems, funny poems for cards in particular, you will really love these. No matter what you get Dad for Father’s Day–even if it breaks, goes out of style, or gets eaten up–cards last a lifetime. I don’t know about you, but I even have a little spot in my sock drawer where I keep all mine. Anyone else? That’s one thing every Mom and Dad have in common: They keep the cards and notes kids write to them. When the poems you include are really special, those cards will get read and re-read. Have you ever caught your dad looking over his card one more time before he slides it back in the envelope? You know you’ve done well when you get an immediate second read-through! Hopefully, these poems will warrant that! Funny Father’s Day poetry will give you a chance to add a little humor to Dad’s special day. I love how these poems for Dads make me smile but also remind me to appreciate everything dads do. You better quit crying or I’ll give you something to cry about! If your best friend jumps off a bridge, are you going to do it too? Thanks, Dad, for saying so. :: Find more inspiring Father’s Day poetry on Faithful Provisions. There’s a time to be early and a time to be late. There’s a time to go steady and a time to just date. There’s a time to fish and a time to cut bait. There’s a time to open presents and a time to wait. my dad said all I needed to hear. my dad let us kids know just who was boss. his pride and love would always come across. Are you keeping your cards light-hearted and fun? Try these Happy Poems for Father’s Day. If you’re looking for more free Father’s Day poetry, you’ll like this classic for Dad’s Day by Helen Steiner Rice. :: Be sure to checkout my retail restaurant coupons for ideas on Father’s Day restaurant deals. Normally I don’t learn write-up about websites, nevertheless i would want to express that this particular write-up really required my family to undertake them! Ones way with words may be pleasantly surprised us. Thank you, pretty excellent article.